The outlook for practice in 2006 looks grim. Unless Congress intervenes, by the time you read this, Medicare will have imposed a 4.4-percent physician pay cut. The trickle-down effect from this act will reduce our incomes even further as other payers – who structure their reimbursements as a percentage of Medicare-allotted payments – follow suit. To try to compensate for these losses, many of us will cram in more visits or increase procedures. Patients will get shortchanged, more findings will be missed, and our liability – already precariously poised – will be in even greater jeopardy. I will decrease prescribing errors. With so many electronic drug databases and medication calculators now available – online, on handhelds, and in electronic health records – it is easy to avoid mistakes that result from dosage errors or drug interactions. Steven P. Ringel, MD, Director of the Neuromuscular Division at the University of Colorado and Associate Editor-in-chief of Neurology Today, purchased Epocrates from the AAN for his Tungsten T3, a personal digital assistant. He uses it to read the common side effects of drugs to patients and to give them estimates of pill costs. The multi-check feature alerts him to review medications that could interfere with each other for his patients who are often on numerous drugs. I will start using an electronic health record. Electronic health records (EHRs) can reduce a variety of costs associated with manual charting and storage as well as improve office efficiency and prevent losses associated with E-M down-coding. Because each data entry is retained as a discrete piece of information, virtually any portion of the chart becomes readily searchable. James R. Storey, MD, who established a five-person neurology practice in Albany, NY, began phasing in components of the Intergy system by WebMD (now Emdeon) last year. After successfully implementing electronic scheduling, billing, prescribing, and scanning components, the practice is ready to integrate the EHR module. Dr. Storey anticipates realizing over $100,000 in transcription savings alone. Best of all, the EHRs will allow his practice, which participates in numerous clinical trials, to go back into the databases and run searches for specific diagnoses, physical examination findings, and prescriptions. “An electronic system makes it much easier to find potential trial subjects and review outcomes and treatment data,” Dr. Storey said. I will drop payers with high-hassle factors. While some insurance companies appear to reimburse well, they engage in practices that ultimately make providing care for their members too costly. Systematic down-coding, chronically delayed payments, and inaccurate denials all take up a disproportionate amount of secretarial time. Meet with your staff to find out which payers have the highest hassle factor. Do claims personnel keep your secretaries on hold for a long time? Do they make errors in processing your claims? Do they hold up reimbursement by requesting more information or additional documentation? “When I meet with my staff, they tell me that they are overwhelmed by billing problems, and those problems seem to stem from the same few payers,” said Neil A. Busis, MD, a member of the AAN Medical Economics and Management Subcommittee (MEM). Rather than hire new staff to handle the hassles, Dr. Busis said, he is going to drop those payers. I will stay involved in the daily practice management of my office. While we all went into medicine to care for patients, it is no longer possible to neglect the health of our business. Show me a doctor who believes that coding, billing, and practice management is not something a physician needs to know, and I will show you a practice that is leaving lots of money on the table. “With the current push for pay-for-performance and other external economic forces, paying attention to such mundane management details as overhead, productivity, and effective billing is more critical than ever,” said AAN MEM member Bruce Sigsbee, MD. I will try not to keep my patients waiting. It is easy to fall behind on any given day. We get phone call interruptions from patients, other doctors, and from hospitals. Our secretaries ask us to sign off on refills and intervene with insurance personnel. Meanwhile, our waiting rooms fill up and patients become annoyed. Russell D. Snyder, MD, a pediatric neurologist at the University of New Mexico in Albuquerque, insists that most, if not all, of the waits are physician-generated and can be avoided. He intends to put off interruptions and to review charts and records while with patients. He also plans to help patients avoid unnecessary return visits by conveying test results and directions for therapy programs by telephone calls or letters – after his day is over. I will include my patients in measures to secure safe practices. Involving patients in their daily care can decrease medical errors and improve compliance. Asking patients to help by bringing their medication lists or bottles and by keeping us informed of any allergies, adverse reactions, or new prescriptions can go a long way to prevent problems in an environment with multiple providers of care. Daniel M. Feinberg, MD, Patient Safety Officer at Pennsylvania Hospital and a member of the AAN Patient Safety Subcommittee, asks his patients to take an active role in ensuring their health. “I ask them to bring their prescription bottles or a list of medications to each visit so that I can review them,” he said. He is also concerned about the potential for missing test results or lack of follow-through for test completion. “I will tell patients that I will call them even if their results are normal, but if they do not hear from me, they should call my office”. I will put the interest of each patient first. Former AAN President Nelson G. Richards, MD, had been in practice for 40 years when he retired in 2004. But when, as a new Medicare enrollee, he began searching for a primary care physician, he could not find one who would accept new patients. “I just could not get beyond the front desk!” he exclaimed. “The way a physician treats patients should be the way that a physician would want to be treated were the roles reversed,” said Glenn A. Mackin, MD, who chaired the AAN Ethics Law and Humanities Committee Professionalism Workgroup from 2003 to 2005. Physicians who strive for the ideal of consistent professionalism, he explained, know that all they may do for patients derives from trust and consent from patients. In essence, professionalism means offering patients optimal care – based on the best available clinical evidence and guidelines – seamlessly interwoven with human virtues including honesty, reliability, and kindness. I will remember why I am a neurologist. We like to say that neurologists are special, that we become enthralled by remarkable findings, and that our specialty is by far the most interesting. Worn down by insurance company battles and the ever-increasing regulations, however, we could all use an annual reminder of why we chose our field in the first place. 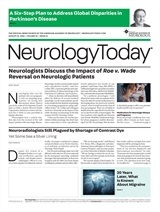 Neurology Today6(1):30-31, January 3, 2006.